Providing the functionality that makes iPromote unique. Covering unparalleled multi-channel distribution, near real-time analytics, robust and tailored ad delivery, and intelligent creative. iPromote's suite of technologies ensure a solution specific to your business needs. Your single source for serving web, mobile, and social ads under a single optimized budget. Increase efficiency with our consolidated 3-in-1 approach. Publish once, syndicate everywhere through 3-in-1 Advertising. Proprietary yield algorithms maximize performance across your own custom mix of display channels. Use our Ad Builder to automatically create web, mobile, and social ads using existing web and social content. Design assets are pulled directly from existing website content and social platforms. HTML5 based ads work great on all devices. A variety of different customizable design templates provide flexibility and customization. Our revolutionary programmatic approach to display advertising is centered around precision and scalability. AdXpert is iPromote’s proprietary decision engine responsible for powering all programmatic ad serving processes. Performance data is analyzed after every auction to identify discrete patterns so intelligent and timely adjustments are constantly being made. Micro-budget technology delivers campaign budgets of any size without any wasteful overages. So accurate, it's guaranteed. More than a decade of online advertising experience ensures you show the right ads to the right audiences. AdXpert is extremely robust, processing billions of auctions and serving millions of ad impressions every single day. Get detailed, near real-time reports available 24/7 for all campaigns. View top sites, top cities, click breakdown, and a daily summary of impressions and clicks. iPromote’s patent-pending metric for post-view display attribution. Display-Driven Search (DDS) helps measure the number of people who visit an advertiser’s website after one of the display ads have been viewed. No matter the budget size, iPromote solutions are optimized to deliver campaigns smoothly and consistently over the course of the campaign, eliminating spikes and costly overages. Deliver ads with increased relevance to viewers that have shown an interest in an advertiser’s business and/or businesses similar to theirs. Your ads are built using modern HTML5 technologies so they look great on all devices without requiring Flash. 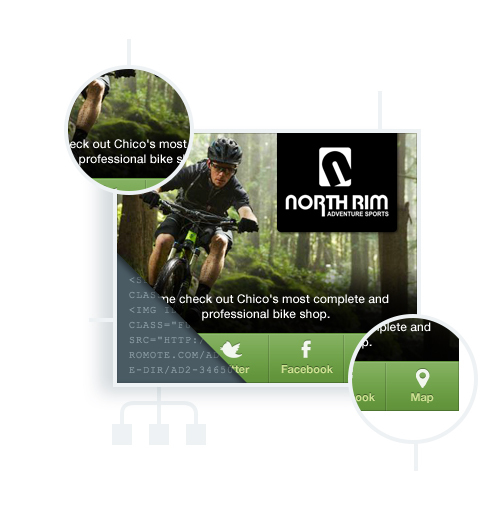 Improve CTRs by adding multiple links to your ads, including Website, Facebook, Twitter, Google+, and Maps. Mobile click-to-call is also supported when a phone number is provided. iPromote’s Demand Side Platform (DSP) delivers display ads using modern auction-based methods. This is critical for scalability as it enables inventory procurement on a per-impression basis. Programmatic delivery ensures intelligent ad selection and display. Our solutions rely on industry-leading technologies to deliver your custom ad serving experience.